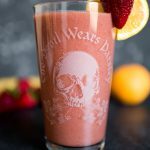 Strawberry Banana Superfood Smoothie - Get Your Beauty On! Yes, I used it – that cringe-worthy buzz-word SUPERFOOD! I take all of that stuff in stride though, because really – all whole, raw ingredients in this smoothie are superfoods in my book. Most of the time, it’s always about green smoothies at my house. Any opportunity to get those greens in, we take it! But sometimes, there’s an over abundance of fruit, and this “superfood smoothie” is a great way to use all your fruity odds and ends up. This one reminds me of the nostalgic “Gold Medalist” smoothie from when I used to work at T.G.I.Friday’s, only it’s WAY healthier, and tastier I might add! There are no syrups, no highly processed pina colada mixes, only honest to goodness whole, delicious ingredients that are great for you. While açaí is not grown in the US, it is becoming more widely available in supermarkets here. I didn’t think I’d be able to find it at mine local grocer, but lo and behold, in the frozen berry section, there they were! I use Sambazon Açaí Berry + Guarana Smoothie Packs mainly because that’s the only brand I could find, but they really are great! They come in single serving packets, and are great especially when you’re going to drink the smoothie right away. It makes it frosty good! It definitely lives up to the hype, having 500 percent more anti-oxidants than blueberries, making your skin radiant among a plethora of other things. It also contains omega fatty acids, helping deliver fat-soluble vitamins to the skin, and helps clean toxins out of your body. While strawberries can be very sweet, thus containing a bunch of sugar, they are also very rich in fiber, which helps mediate your blood sugar levels. The ellagic acid that they contain also help with blood sugar control and help you burn fat! Have high blood pressure? They help reduce hypertension by way of their anthocyanin content. What the heck is an anthocyanin I can hear you ask? It’s a flavonoid that is responsible for the beautiful rich color of the strawberry, and is found very prominently in blueberries, blackberries, grapes and many other colorful fruits and vegetables. Bananas are rich in vitamin B6, helping ward off insomnia and irritability, and also contain magnesium, promoting better sleep patterns. I’ve always had a bit of trouble sleeping, so it looks like I need more bananas in my life! The amino-acid tryptophan is also found in bananas, which is a mood booster. When you’re happy, you get better sleep too! It also helps prevent constipation, promotes good digestion, and helps regulate proper fluid levels in your body due to its potassium content. Oranges are pretty much synonymous with Vitamin C. That goes without saying. But they also have other great properties too! They help raise the good cholesterol (HDL), and work to block the uptake of of cholesterol, meaning that your bad cholesterol (LDL) gets lowered. They contain a plethora of phytochemicals that help with taming inflammation. SCORE! These are just a few of the benefits of these “superfoods” which are really just regular, whole foods that help nourish, repair and balance your beautiful body. 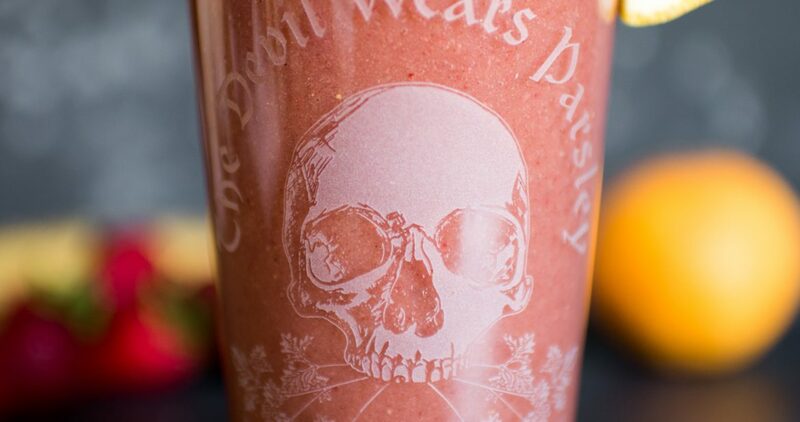 This smoothie is not only good for you, it tastes amazing – sweet, full of fiber, and filling. 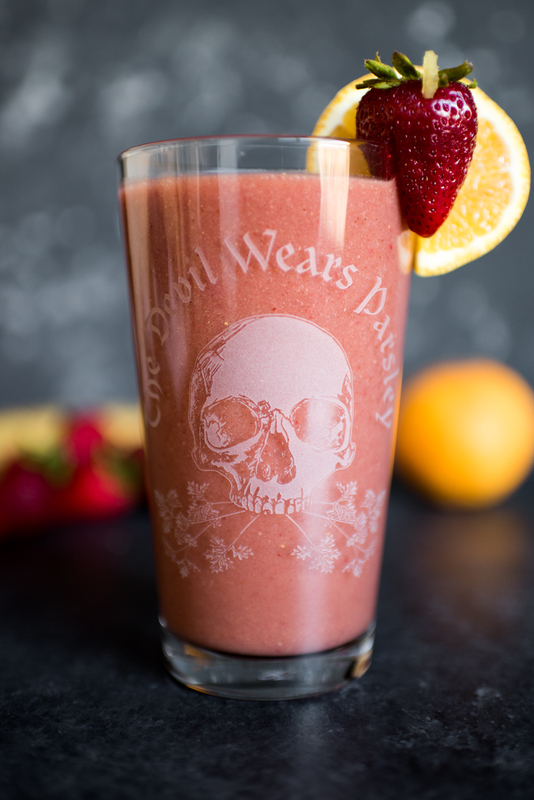 If you would like your very own rock-n-roll smoothie pint glass like the one pictured, they’re available in my new web store! 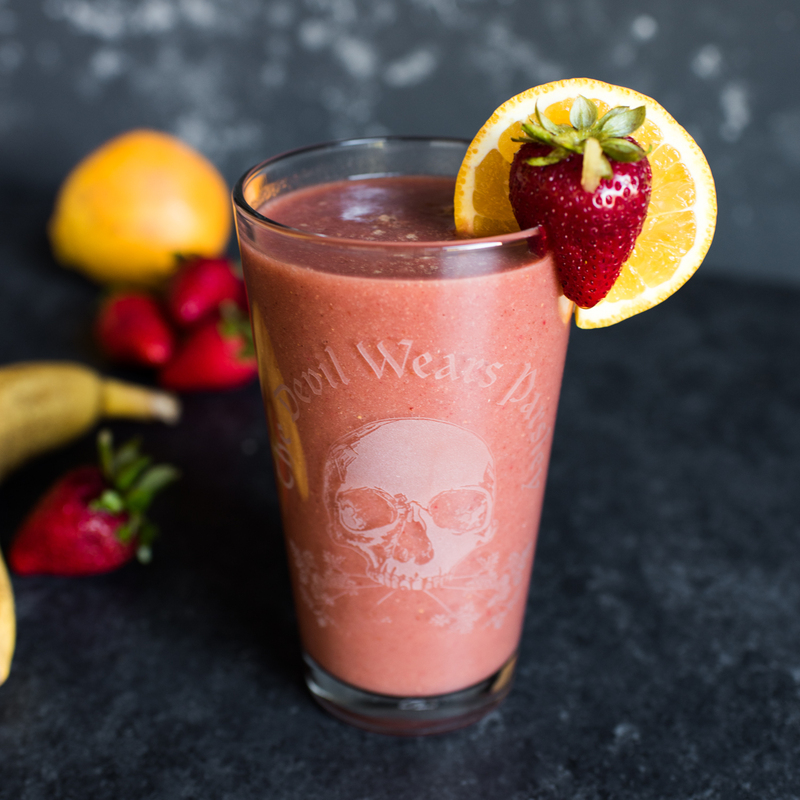 This strawberry banana smoothie will get your morning started right! Put all ingredients in a blender, and blend until smooth, about 45-60 seconds. Divide into two 16 ounce pint glasses, and garnish with a strawberry and orange wheel. *Disclaimer – I was not compensated in any way for this post. All opinions are solely my own.